“Scotland is social democratic, but England is a Tory country,” was first current in the days of the Thatcher supremacy, but has re-emerged as an axiomatic part of the rhetoric of the pro-independence camp. Alex Massie has addressed some of the issues in his Speccy blog piece. This looks at the evidence of social attitudes surveys, and comes to two conclusions. The first is that if there are any differences between attitudes to welfare, public services and taxation between England and Scotland, it is not by much. And his second conclusion is – as the title says – that if the UK is divided, the fault line is not along Hadrian’s Wall but somewhere in the English Midlands. Any demarcation line is between the North and South of the UK rather than between English and Scots. “The other ‘evidence’ put forward by the Yes Scotland (or at least its leftish, sort-of, anything but Labour section) is that Scotland has consistently voted in a way which is more supportive of a left of centre agenda. 1. The ideal social-democratic welfare state is based on the principle of universalism, granting access to benefits and services [to everyone irrespective of income] based on citizenship. Such a welfare state is said to provide a relatively high degree of autonomy, limiting the reliance of family and market (Ferragina and Seeleib-Kaiser 2011).In this context, social policies are perceived as ‘politics against the market’ (Esping-Andersen 1985). 2. Christian-democratic welfare states are based on the principle of subsidiarity and the dominance of social insurance schemes, offering a medium level of decommodification and permitting a high degree of social stratification. 3. The [neo]liberal regime is based on market dominance and private provision; ideally, the state only interferes to ameliorate poverty and provide for basic needs, largely on a means-tested basis. Hence, the decommodification potential of state benefits is assumed to be low and social stratification high (Ferragina and Seeleib-Kaiser 2011). I’m confused, you appear to be attacking universalism, as advocated by the SNP (‘free’ higher education, care for the elderly etc) as right wing neoliberal contrasting this with ‘means tested’ benefits as supposedly social democratic. Everyone knows it’s the complete opposite. Only those of right-wing leanings try to hoodwink the public on this one. I direct you to this excellent article on how what you are suggesting (means tested benefits as proposed by Labour, the Tories and the Liberals) is a way of destroying the welfare state. From the British Medical Journal. Of course I don’t expect this post to be published, but hey ho, I tried. tuition fees, personal care and bus passes. Talk about shooting yourself in the foot. What will be the next move ? Convincing them that means-testing, creeping privatisation and fragmentation of our public services is the new social justice. Thanks but no thanks Peter – I’ll keep voting SNP and backing universalism whilst waiting for your great leap forward. I’m confused Peter !! 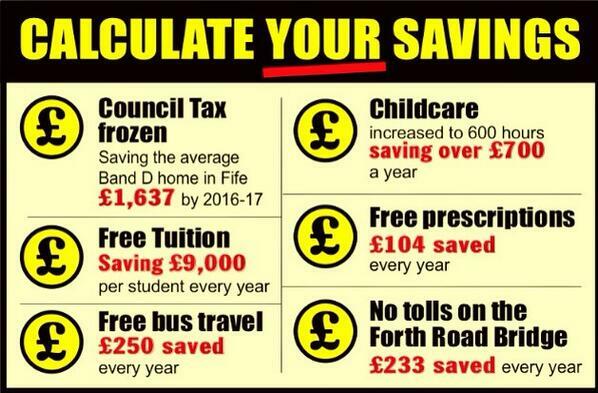 surely that leaflet you have shown is the Labour leaflet your party was touting during the dunfermline bye-election, you know the one where you were claiming all the SNP policys, it certainly looks like it. As for Scotland being more left wing than England I have to agree that is wrong at the present time, with their being 1 tory, 41 labour & 11 Libdem MP’s parties all fighting for the middle england right wing vote they certainly out number the 6 SNP MP’s. Because their is no way Labour can be called a party of the people anymore.